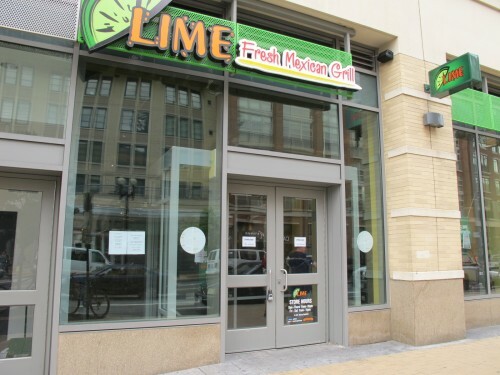 Lime Fresh Mexican Grill, the popular Florida-based fast-casual Mexican concept, will celebrate the opening of its first District location in Columbia Heights (there are two other locations in the metro area) with a ribbon cutting on Tuesday, August 28th with Mayor Gray. The South Beach bred concept has partnered with the Mayor and his team to utilize and promote his One City ● One Hire initiative, a program directed at putting DC residents back to work – Lime Columbia Heights has hired 30 DC residents for their team. The ribbon cutting also serves as a celebration of DC’s lowest unemployment rate in the last three and a half years. Famous for its signature blend of fresh, mouth-watering Mexican dishes, dynamic ambiance, stylized interiors and scrupulous service, Lime was originally conceived in 2004 to complement the vibrant and food-conscious culture of South Beach. Lime has garnered a following from locals and celebrities alike, by serving Mexican-style cuisine using only the freshest ingredients, and charbroils on grills in an exhibition-style kitchen. Additionally, all locations feature a signature homemade salsa bar and 50 variations of hot sauces. Guests have the option of whole wheat, multi-grain or low-carb items, and everything on the menu has 0 Trans fat. Columbia Height’s Lime Fresh Mexican Grill will officially open for business on Wednesday, August 29th and is located at 3100 14th Street NW, within the DC USA shopping center. Lime Fresh Mexican Grill is open from 11 a.m. – 10 p.m., Sunday through Thursday, and 11 a.m. – 11 p.m., Friday and Saturday.